Ok, so I was on IRC the other day when Blizzard brought up that he was playing Phantasy Star Online Blue Burst on a private server. Now, if you don't know, it's a RPG that was made for the Dreamcast back in 2000, yet, it's been ported onto the PC, Gamecube, Xbox, and things like that as well. What makes it awesome? It was made into a MMORPG, and unlike most of it's type, this one you can actually play in Single Player, and it's actually enjoyable. Alas, the servers were shut down for good a few months ago, until I was introduced to this one. This private server lets you play the Gamecube, Dreamcast, and PC versions of the game. The PC version is called Phantasy Star Blue Burst, and, is Phantasy Star Episodes 1, 2, and 3 put into one game. Now, onto the server. Now, some pictures, pictures make topic like this better. Oh, I forgot to mention. With the servers, some of the don't have translations for the japanese text. I mainly go to Skyline, usually because it's all english. Another thing, I have 4 characters. Snuggletummy, ChaosWolf, Epsilon, and Polaris. Another thing. The Japanese Patch thing. If it says that there was an error, I'd say to just not worry about that, as, it did to Luminaflare and I, and hasn't affected the game in any way. Edit: I just made a guild called Metanet. I think the only way you can join is if we're in a game together. I'll definitely have to give this a try. I just finished downloading it, so if you want too I'll play. this game is unbelievably badass and probably the best MMO ever made. i played it on the dreamcast and even took the trouble to set up the Gamecube version so i could play online back when it released, i liked it so much. Also, like I said in the first post, I made a guild, or, team. The only way that I think you join it, though, is if we are playing in a game together. I'm usually in the Skyline server, Block 2, Room 13 (That's the Casino). Also, for those who don't want to look through the first post, here are some things. I hope to see you all in game. Last boss in this is crazy. Me and Obylisk frequently play, but the game is more fun the more people you have. So if you can come play with us! Blizzard, Quote, Obylisk, and I killed Dark Falz, the last boss of Episode I. I'm Gamma, Quote is Quotetype. Blizzard is Milani, and Obylisk is Obylisk. 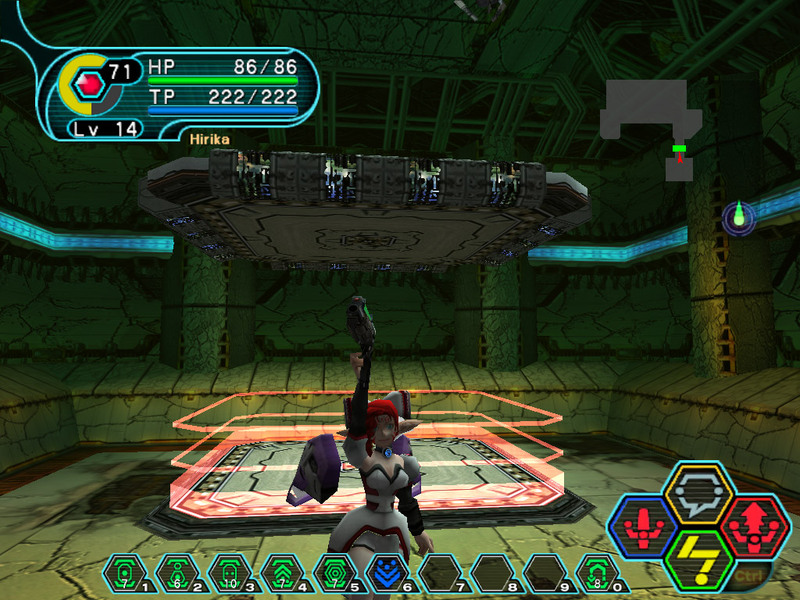 Please note that Dark Falz killed me about 6 times, blizzard once, and everyone else i don't think died. Yeah, the Reverser tech comes in real handy for those fights. Fun stuff. You guys play it too? I play with the guys over 72dpiarmy. Level 36, and my god, look at my MAG. and my knives O_o. awesome, i finally got it working! Man, Blizzard finds us *all* the cool games. Hey guys. I finally made it to level 40, so now I can access Very hard mode, which, is... Very Hard. Also, if anyone needs me, and you expect to contact me on mIRC. I've left #n due to the fact that everyone there insists on making me angry, just so they can watch my reaction. If you ever need me, go to #Doomsday instead. Anyway, back on topic, I hope you all enjoy playing the game though, and I hope more people play the game. So remember, if you need me, PM me or go to #Doomsday on IRC. Oh, and I almost forgot. PSO Guide. Alas, it's only for Episode I, but even so, it's pretty useful. Even though I dislike double posts, this is clearly a bump. I've just started playing the game again and I have come to show you all this really crazy gun someone had. I mean seriously... look at that. Obylisk, 2 random people, and I beat Dark Falz again, this time on Hard Mode, and might I add, I died 99% of the time due to his attacks only killing me in one hit.. and I'm the class that is supposed to take all the damage. Another thing, if anyone wants to play with me, just ask in this topic and we can play, as I now see how cool the weapons can get, and the fact that 4 player Co-op turns out to be freaking amazing when you've gotten a game going. Here, have a look at this. We beat the last boss again on Very Hard. And hey look! A new sword. EDIT: Wow, look where a day and a half of playing can get you. Level 16 now.